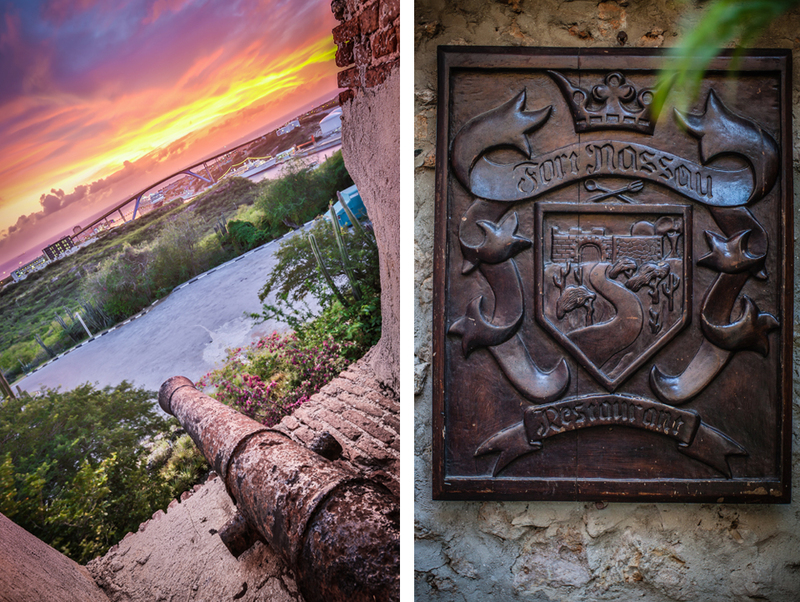 You haven’t seen Curacao if you haven’t been to Fort Nassau! Fort Nassau restaurant is unique in all aspects. Situated high upon a hill at the harbour’s entrance, it has a beautiful 360º view over part of the island and the city of Willemstad with the unique bridges that connect Punda and Otrobanda. At night a sea of lights stretches to the horizon offering the most spectacular view. The historical character of the 18th century fort, the contemporary interior, the breathtaking view and good food, make your visit to Fort Nassau a memorable experience. Restaurant Fort Nassau offers a diverse menu and can be best described as “casual fine dining”. Lunch and dinner are served in the semi open-air restaurant. The Curaçao sunset is best viewed from the terrace around the bar, tropical cocktail in hand! Fort Nassau was built in 1797 to defend the island from enemy attacks. The Fort was originally named Fort Republic until The British invaded the island in 1807 and gained control of the town and all its Forts. To honor England’s King the British changed the name to Fort George. In 1816 the island was given back to the Dutch. In honor of the Dutch Royal family the Fort was renamed Fort Orange Nassau. Today the Fort plays a vital role for the harbor (it is from here the harbor master signals to myriad incoming and outgoing vessels). In 1959, The Monument Foundation of Curacao declared Fort Nassau a National Monument. Today the canons along the Fort walls, the former Fort prison and the primitive toilet used by the soldiers are testimonials to the period in which Fort Nassau was on duty long ago. Grilled Rock lobster tail-10 oz.